Just listed on the market in the coastal paradise of North Palm Beach, Florida is this meticulously landscaped sprawling waterfront gem. 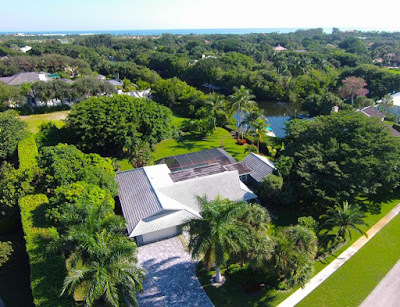 Tucked away in the sensational Captain’s Key is this four bedroom/two and a half bathroom home that offers lagoon views throughout its 2,815 square feet of bright and airy living space. A generous gourmet style kitchen is graciously equipped with sleek granite counter tops and a full suite of stainless steel appliances. The sparkling swimming pool is part of the picturesque oasis that the backyard offers. The lagoon has a dock with a ten thousand pound boat lift. The lagoon only has one bridge with a twelve foot clearance to the wide open waters! The home is set on a generously scaled, almost acre of land. The flooring throughout is a stunning Italian ceramic tile. 12260 Captains Landing is located in North Palm Beach and is currently asking $2,695,000. This Captain's Key listing is courtesy of Leibowitz Realty Group MLS# RX-10175269. Captain’s Key is an exclusive enclave nestled in North Palm beach. Residents enjoy five star shopping and dining such as The Gardens Mall, Legacy Place, Downtown at The Gardens and Harbourside Place. Located on just north of PGA Boulevard, residents of Captain’s Key also enjoy close proximity to Palm Beach International Airport.